This entry was posted in Substance Abuse and tagged Alcohol Abuse and Addiction, Food Addiction, Preventing Misuse, Signs and Symptoms on September 30, 2016 by Team Addiction Hope. What do you think is the most widespread addiction in America? Studies show that it could actually be sugar. On average, each American consumes an astounding 22 teaspoons of added sugar each day. This is sugar that does not come from the daily intake of fruit. Instead, this sugar comes from junk food and drinks – and sometimes even regular dinner entrees. People find it easier to become addicted to sugar than they would to even the hardest street drugs. In fact, they are more likely to get hooked on sugar than cocaine, heroin or morphine. Sugar is easy to obtain and hard to avoid. The average can of soda, for example, contains an alarming 10.2 teaspoons of sugar. According to the CDC, roughly 1 in 5 Americans drink at least one soda per day, as of 2014. The addictiveness of sugar is largely due to its chemistry when it is processed. Refined sugars trigger a reaction in the brain’s reward center. Endorphins, serotonin and dopamine attach to receptors within the brain. As the chemicals react within the body, they increase feelings of joy and relaxation. All major drugs, including alcohol, work just the same way. The user’s body becomes accustomed to the increased levels of hormones. Once the person’s system is cleared of the alcohol (or sugar), he or she will experience a crash – and end up feeling worse than before. Unfortunately, this new low can create new cravings as people try to compensate for the resulting poor mood. Indeed, this is an incredibly vicious cycle. Another problem with this process is that it greatly disrupts the brain’s natural cycle. Over time, people cannot produce these hormones in a proper amount on their own. Many people will be unable to feel the same without the substance of choice unless they fully recover from their addiction and spend time letting their bodies return to normal. Most of the time, addictive behaviors manifest early in childhood. Many children consume an incredible amount of sweets. If addictive patterns develop at this stage, they will exacerbate as kids grow older. Although sugar addiction is dangerous enough on its own, more serious problems manifest when an individual begins experimenting with alcohol. Gradually, the urge to drink alcohol will replace the yearning for sugar. This is because the effects of alcohol are more immediate and often feel much stronger. Drinking suppresses many systems in the body, such as the frontal lobe. This portion of the brain is responsible for emotions, decision making and inhibition. Whereas people feel good when they eat sugar, they feel fantastic when they begin drinking. Alcohol dependency builds on existing hormonal imbalances and throws the cycle into overdrive. 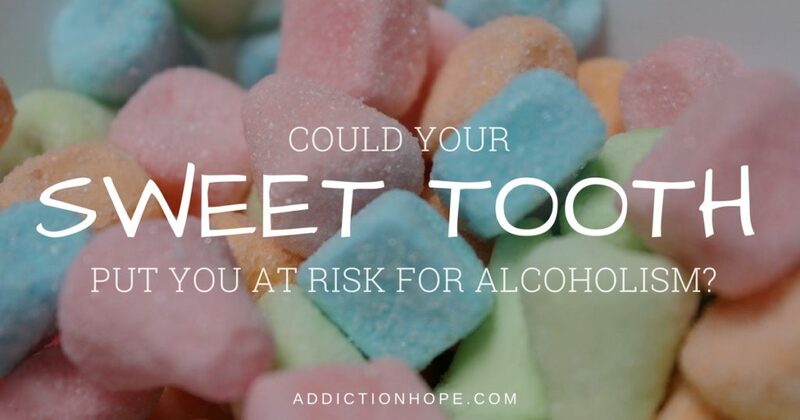 Being addicted to sugar prior to alcohol abuse also sets the user up for a rough recovery. Once alcohol is removed from the system, recovering alcoholics will often begin to crave sugar again to maintain these hormones. In an effort to stop the urge to eat sugar, they may revert to consuming alcohol. It can be hard to recognize addiction. Many people want to hide it from their friends and family, and will go to great lengths to ensure that others remain unaware. In addition, they tend to avoid seeking help because of their denial about the problem. Usually, the help of a friend or family member is instrumental in overcoming addiction. Addiction can be hard to overcome, especially when it is built on a lifetime of dependency. Over the years, the cycle becomes deeply embedded in the brain. In many cases, the only way to combat addiction is to seek professional help. Treatment centers across the country employ effective techniques and qualified professionals to evaluate the dependency, stabilize the patient during withdrawal, and then begin to treat the addicted mind and underlying causes. If you or a loved one is feeling trapped by an addiction to sugar, alcohol or a cycle of both, don’t wait to get help and enter recovery. A healthier life is one phone call away.